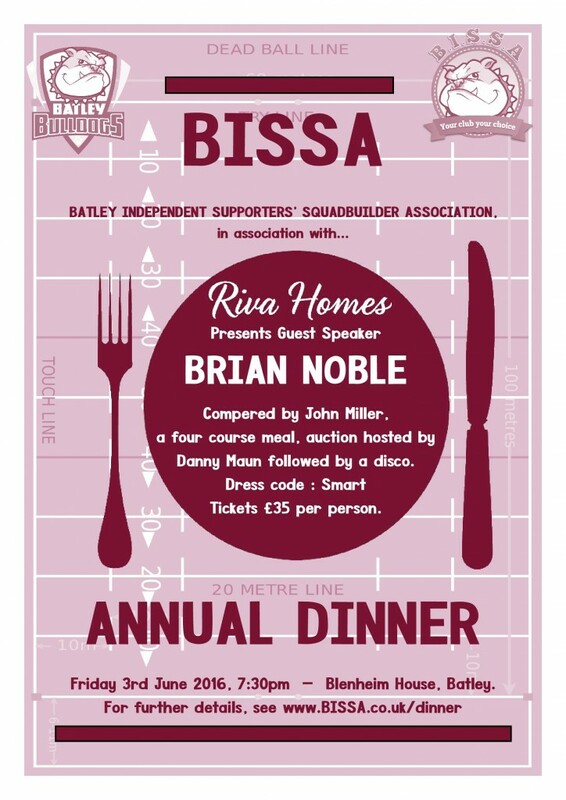 The BISSA Annual dinner is to take place on Friday 3rd June at Blenheim House, Batley. Guest speaker will be former Great Britain Coach Brian Noble, MC will be John Miller and the Auction will be conducted by Danny Maun, there will also be a DJ and Disco afterwards. Tickets, which include a 4 course meal, are priced at £35 per person. Anyone interested in attending should contact a BISSA committee member to book a place. Alternatively, call at the BISSA stall on game day. The evenings events are being sponsored by RIVA Homes of Mirfield. BISSA would like to thank Paul Frain of RIVA Homes, who also sponsor Pat Walker, which without such sponsorship, events like these would be difficult to organise. Your support is greatly appreciated. Tickets can also be purchased online here (booking fees apply).